Since my boyfriend and I celebrated Valentine's yesterday by going to the Great Lakes Science Museum, I was allowed to spend the day today making us some tasty chocolates while he played his video games. All in all, it's been a pretty great way to spend this snowy Valentine's Day I must say. And if you are out of fun ideas to do with a date, doing something together that you can both enjoy, such as making candies, is always a good alternative to dinner and a movie. 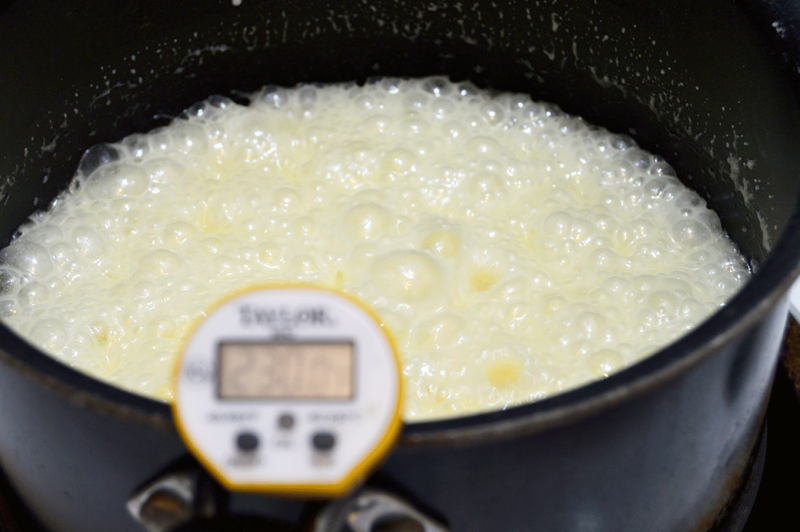 Begin by combining your sugar, butter, milk, heavy cream, and vanilla into a sauce pan over medium high heat. Slowly add the cream of tar tar and stir with a wooden spoon until dissolved. 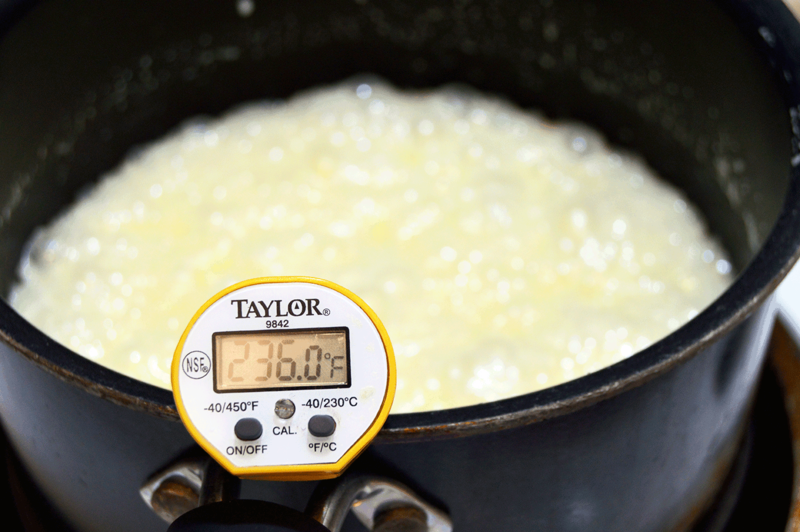 Cook, without stirring, until the blend reaches 236 F. The cream should bubble and double (toil and trouble) in size. Once it reaches 236 F, remove from heat. 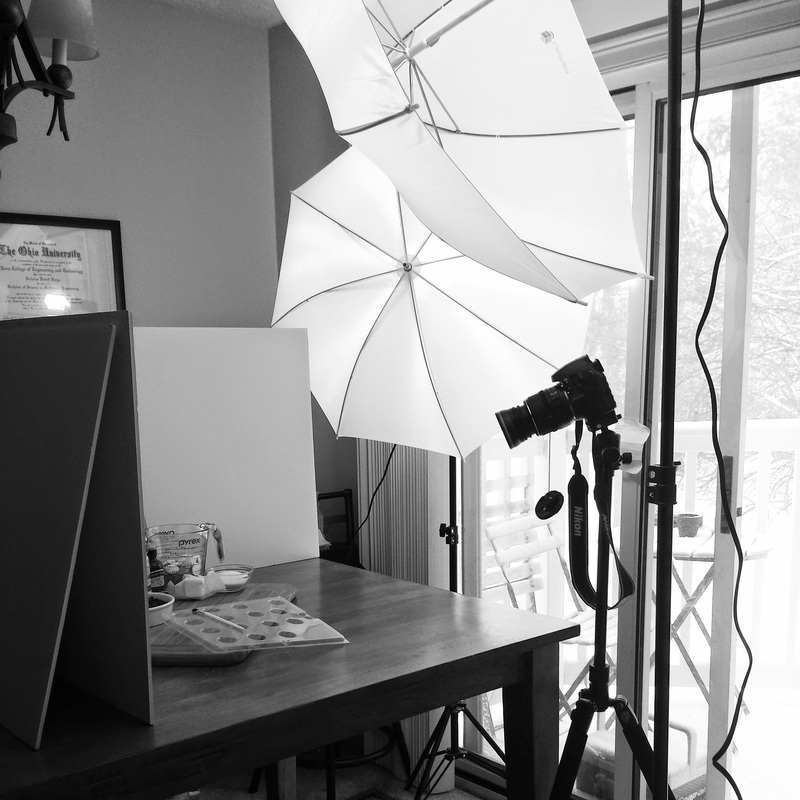 If you have a marble top, great, use that instead to cool and work your cream. But if you're broke, such as myself, a cookie sheet on a cooling rack will have to do. 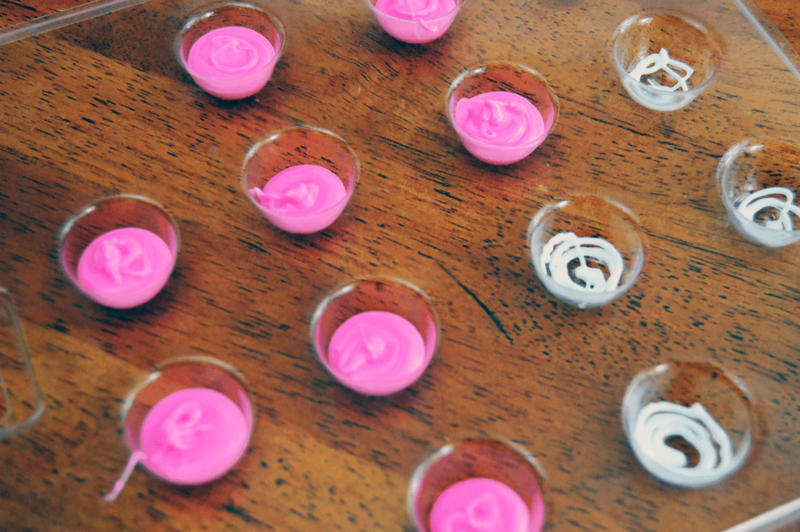 Allow your cream to cool until luke warm, and then use a wooden spoon to scrape the creams up and roll into balls. Leave in a cool place while you prepare your chocolates. 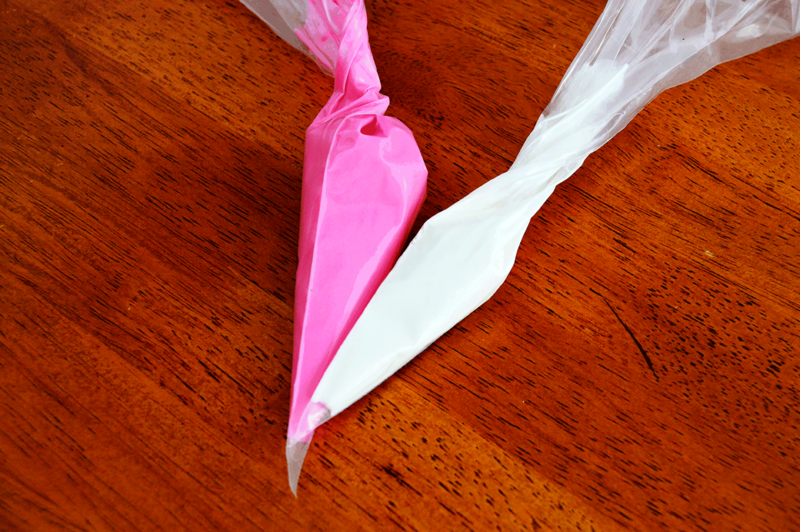 A quick trick for a mess free way to melt your chocolate, microwave it already IN the piping bags! Using 30 second intervals, microwave your chocolates and gently squeeze contents every 30 seconds until completely melted. Here's where you can get creative. If you plan on making a solid colored candy, fill the mold half way. 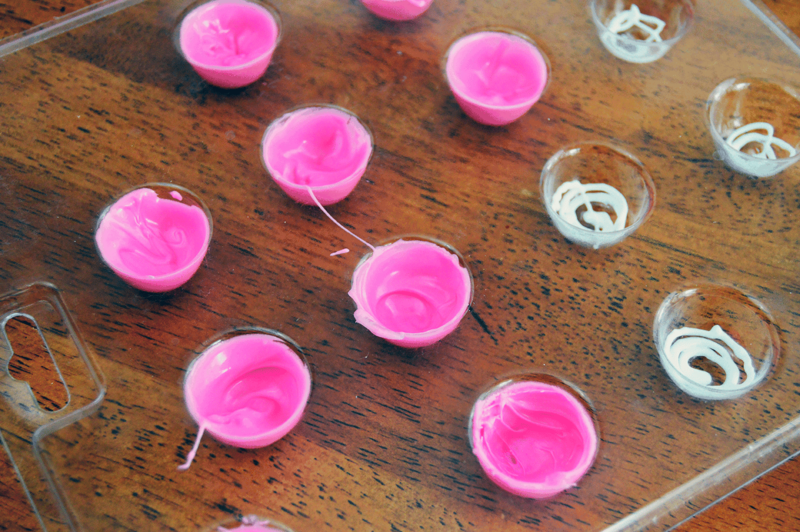 If you want to decorate your candies, you will have to go one layer at a time. Since I want some white swirls on the tops of my chocolates, I have to let that set before adding another layer. 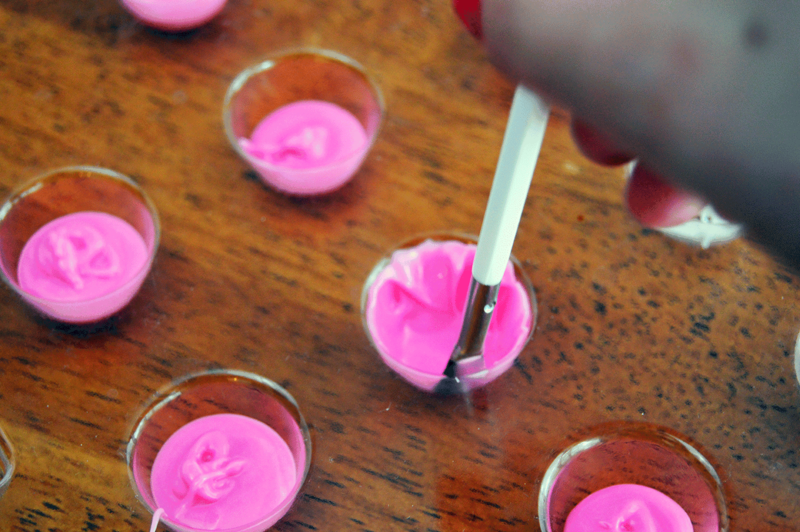 If going the solid color route, use a candy brush to cover the insides of the mold. Then set side to cool. 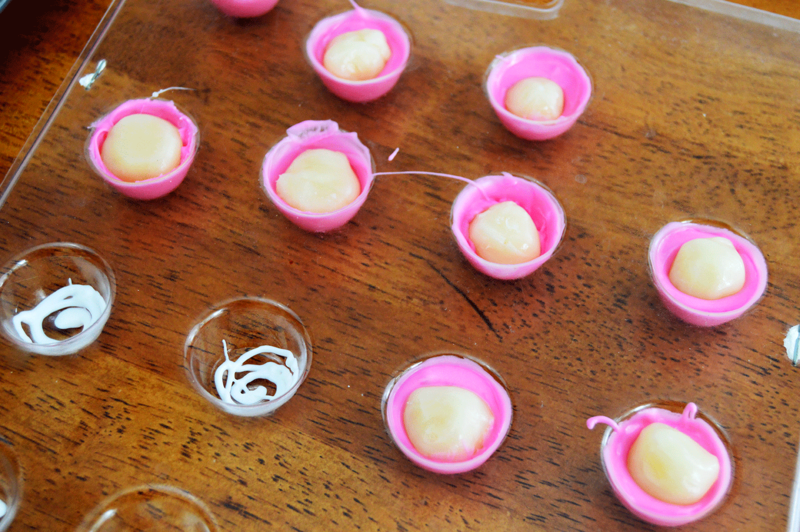 Once your shells have cooled slightly, you can start to add your cream centers. 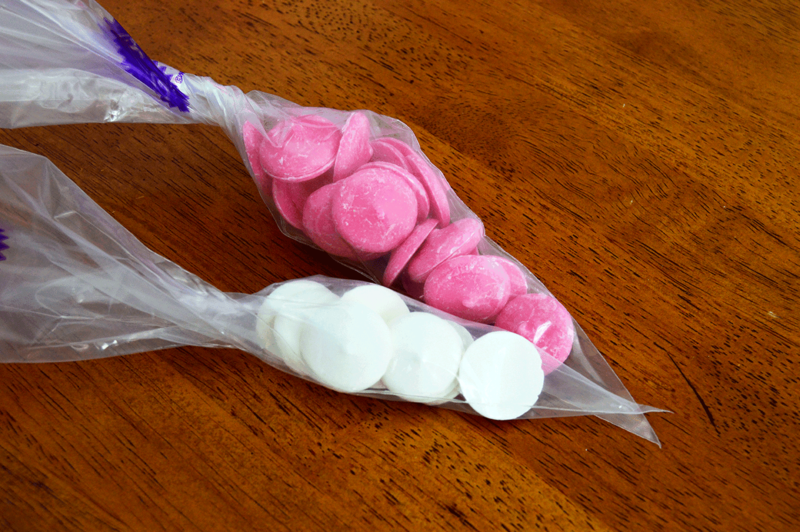 Use the remaining chocolate in your piping bag to fill in the space around the creams. Repeat as necessary depending on how creative you want to get. Then sit back and enjoy a romantic evening with your significant other. Love is in the air. 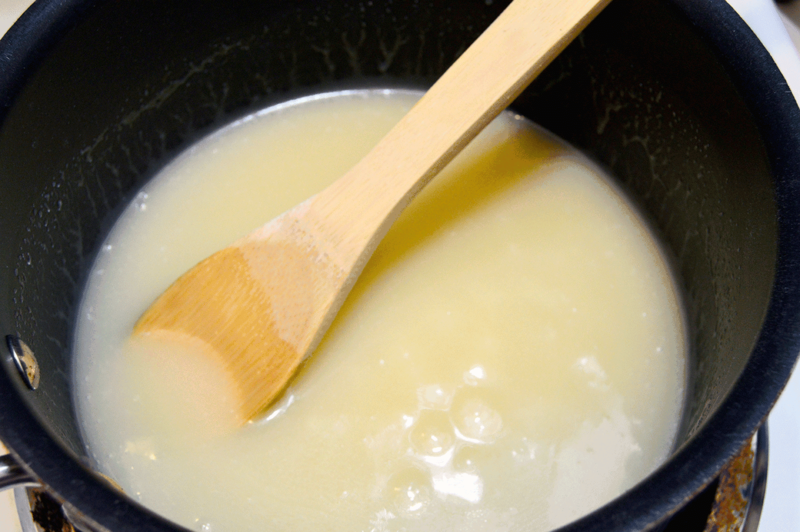 Begin by combining the sugar, milk, cream, butter, and vanilla in a sauce pan over medium heat. Stir until dissolved then add the cream of tar tar. 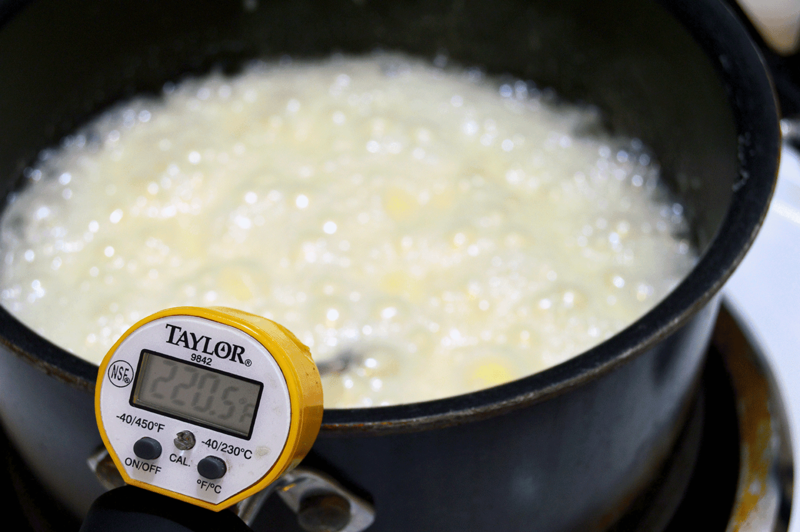 Stir constantly with wooden spoon until all of the ingredients are incorporated, then clip on a candy thermometer and do not stir or remove from heat until the thermometer reads 236 F, about 15 minutes. 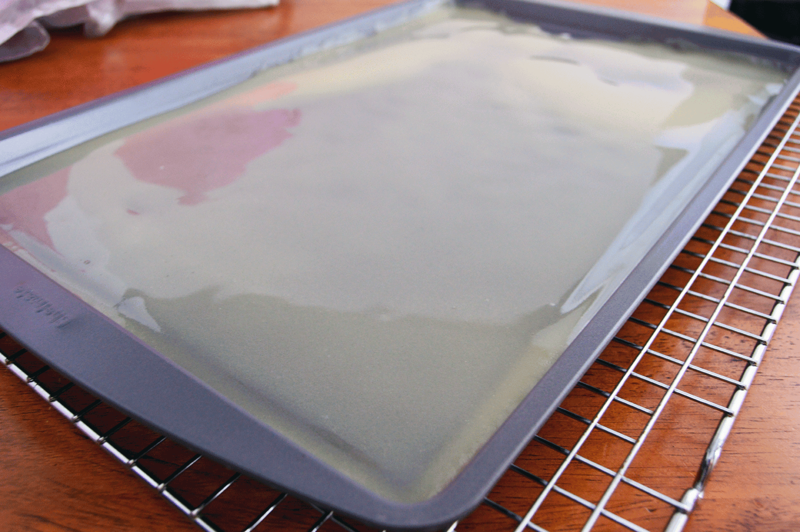 Remove the cream from heat and pour onto a cookie sheet on a cooling rack. Allow to cool unti just warm and easy to work with a spatula or wooden scraper. 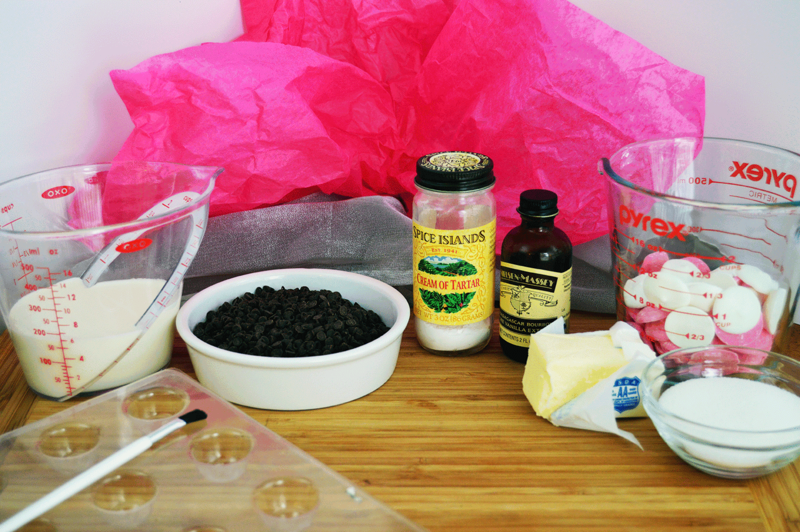 Work the mix until smooth and thick. 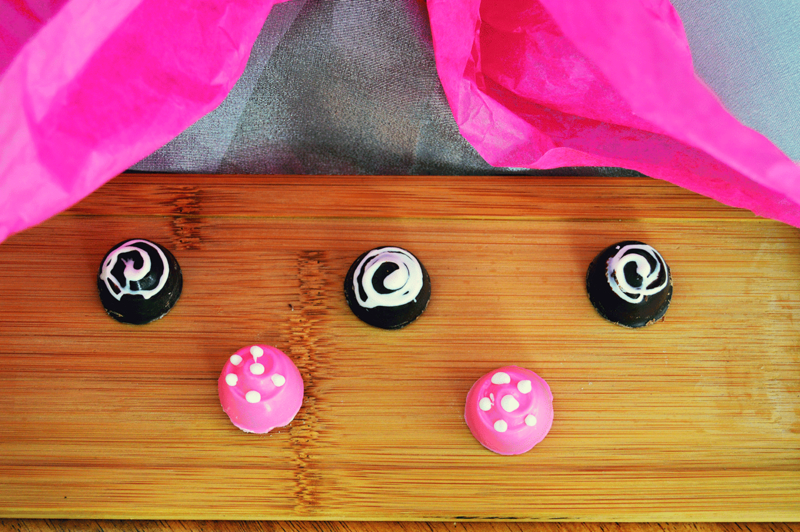 Roll into balls and let set while you prepare the molds with the chocolate. 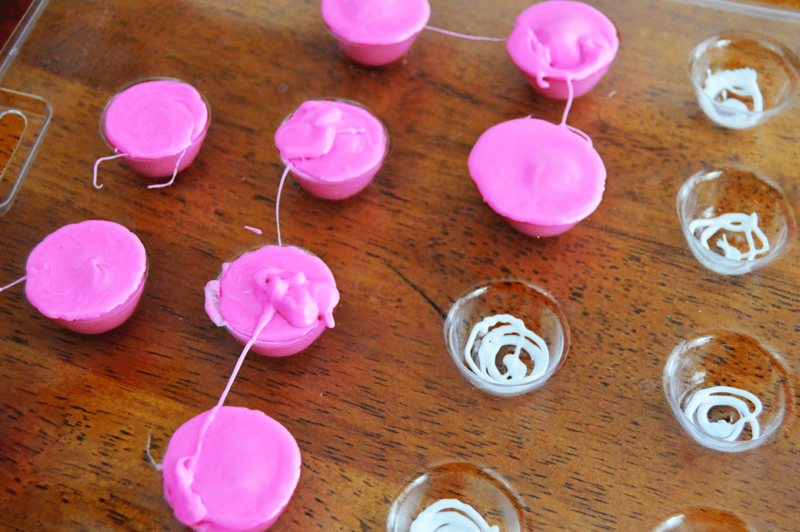 Use a candy brush to cover the sides of the molds with chocolate. Place in a cold place to harden up. 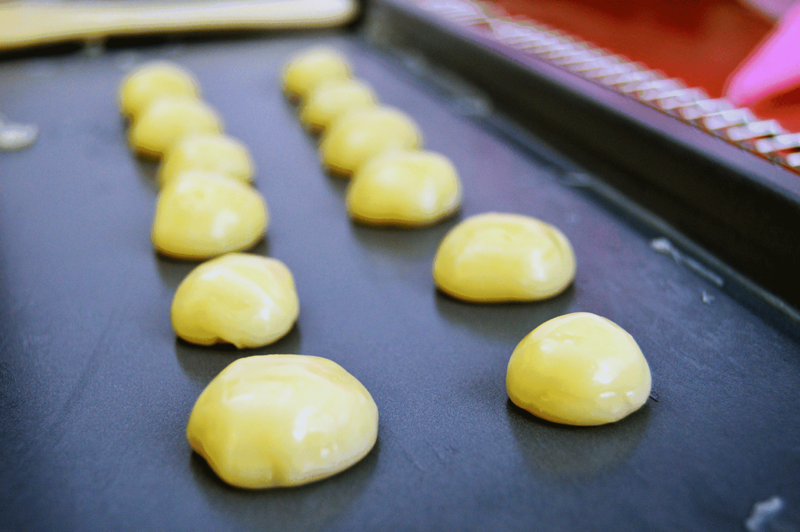 Once hardened, press a cream ball into the center and cover with the remaining chocolate. Tap gently on the table to get rid of any air bubbles. Place back into your fridge and let cool completely before removing. Be sure to store at room temperature. Caress your partner's face and give them a kiss AND a chocolate! This blog was brought to you by my boyfriend, Nick, who indulges me waaay too much in my hobbies. But also wants to play his video games in peace.